With such "clean" lines, almost essential in shape, and so much attention paid to fittings, as per Baia tradition, this boat will be extremely rich and functional. 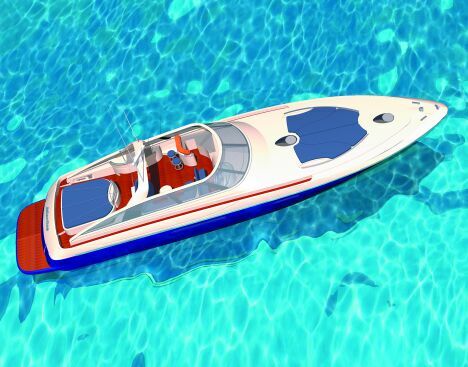 This, in our opinion, is the synthesis of this great new open produced by the Neapolitan yard, a boat that, in line with the intentions of its designers, should also be able to boast both an "ocean" type seaworthiness and the performance of a real racer, as suggested by the use of Arneson surface propellers and engines with maximum total of 4,000 HP. There are two options available for the exteriors: express cruiser, an open with "radar arch" and sprayhood, and motoryacht, characterised by a fixed covering over most of the cockpit, astern enclosed with glass and a side door giving access to the bow and to the top that can be opened. The interior is personalised to the max. The owner can in fact choose the three or four cabin version, with saloon on the upper deck, for the motoryacht version, or below deck. The internal layout, by Arch. Galeazzi, includes an adjoining galley, which is therefore well connected to the crew's quarters. Such quarters, in order to guarantee a maximum level of privacy for the sleeping area can be requested with direct access from the deck. Externally, the two versions of the Atlantica 78 have in common the two spacious sunbathing zones, one on deck and the other in the part astern of the cockpit.